This is the third installment of our 2018 NBA draft coverage where we focus on players ranked 13th to 18th on our Big Board. With the NCAA’s deadline for players to withdraw from the draft in order to keep college eligibility passing on Wednesday, May 30th, we saw just a few guys from our big board head back to school. Most notably was the less popular Porter brother, Jontay. Our big board put him at 18th overall with a high of 16 (me) and a low of 24 (Maahs). 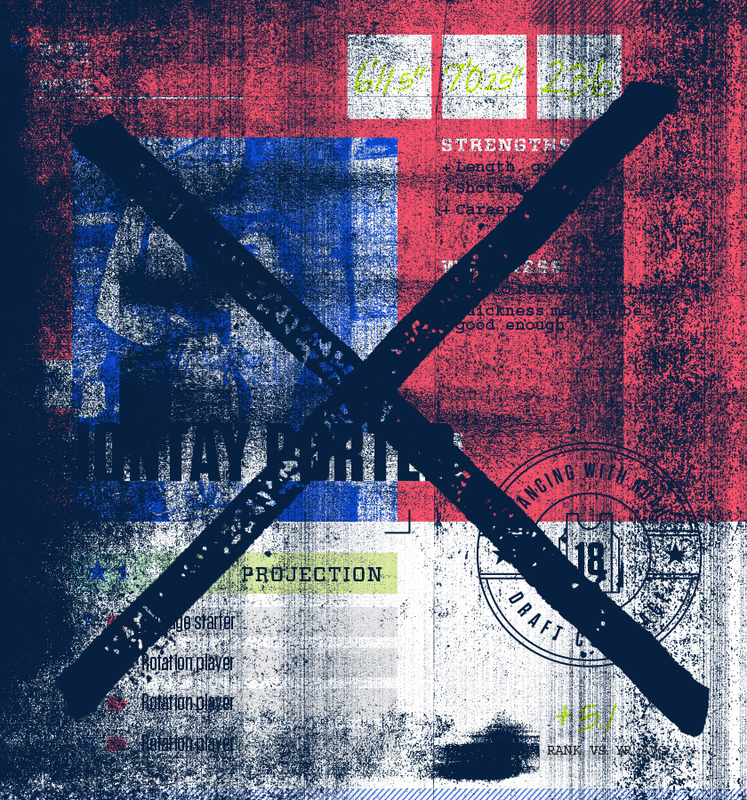 It’s fair to say that after the combine where Porter had the highest body fat percentage, the lowest max vertical (tied), and the slowest three-quarter court sprint, that NBA scouts and front offices had him lower than our lowest rank. As I mentioned in an earlier post, we have tentative plans to update the big board; likely in the upcoming week and I think there’d be quite a bit of movement. My guy Kevin Huerter from Maryland (I ranked him 37th) has been a high riser as has Villanova’s Donte DiVincenzo. Bug and Maahs are high on Mitchell Robinson and I’m still vacillating on my feelings on DeAndre Ayton which mostly boils down to effort and consistency. I even have trepidation about my number one overall player, Luka Doncic (mostly around his handle). We’ll explore all of the above and maybe even get into the meaning of life as viewed through the NBA’s annual scouting and drafting in our next several posts. For now, we’ll focus on players 13 through 18 with an empty spot for the still-Missouri Tiger, young Jontay Porter. Zhaire Smith’s unexpected rise could mean he’s either a late bloomer cut from the Russell Westbrook cloth, or, more simply an athletic standout whose skills won’t ever catch up. In his freshman year at Texas Tech he came out of nowhere both literally and figuratively. He was projected to play only 10-12 minutes per game but instead logged 28 on his way to 11 points and five rebounds with 58% eFG. This wasn’t your run of the mill Texas Tech team either. The clear number-two in the Big-12 ended up a three-seed and made it all the way to the Elite 8. Smith came out of nowhere literally by flying in for tip dunks and rebounds over bigger players. A 6’4” guard getting almost three offensive rebounds-per-game is impressive. He pops up around the ball a lot on both ends and plays hard. That effort combined with elite physical tools can carry a player a long way. Smith told the ESPN combine crew he played center in high school and didn’t shoot threes until his senior year. My fellow Iowan Ricky Davis had a similar career at Davenport North. He’s another NCAA/NBA wing with elite athletic gifts that didn’t get to adequately develop his perimeter skills in high school. Ricky transitioned quickly to the wing at Iowa, but I always had the feeling his development was a stunted a bit by playing out of position during formative years. On the other hand, there’s something to be said for battling big players and learning to play in the paint. That may be even more useful in the modern NBA with all the switching and defenders guarding pretty much everyone at one time or another. Jimmy Bulter and Jae Crowder both played a lot of center at Marquette and have turned into two of the toughest and physical perimeter defenders in the NBA. 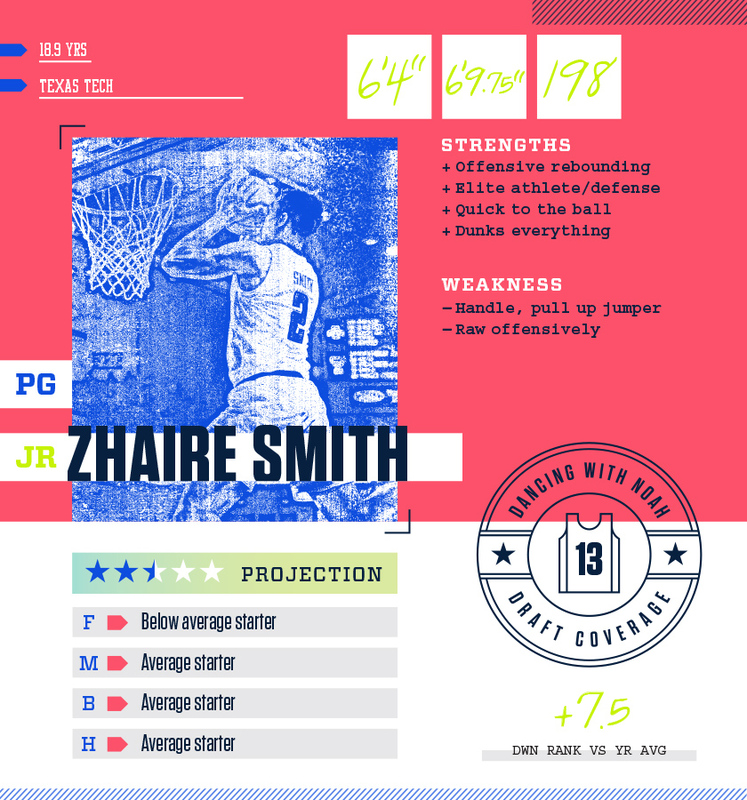 Smith’s rebounding ability and instincts around the hoop show he picked up some things that may help him at the next level. A few of his weaker performances came against tough college defenses like Villanova (seven points, 3-8 shooting) and West Virginia (four points 1-4; nine pts 3-7). He’ll need to improve his ball handling, passing, and most of all shooting from outside to come close to the ceiling his athleticism has set for him. At this point he is just figuring out what do to with his powers and looks like a player teams picking between 10 and 15 will be afraid to take and afraid to pass up too. 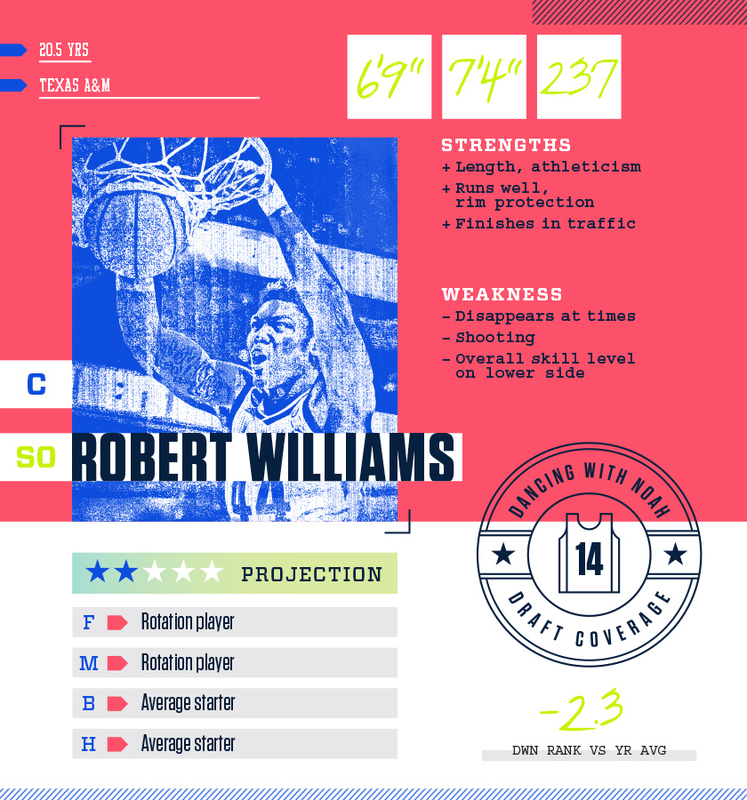 Robert Williams has the physical profile of a contemporary NBA center. He’s a quick leaping big(ish) player who runs well and has great balance. He plays kind of like a smaller DeAndre Jordan but moves like Rudy Gay. He lacks the handle or shooting to be a wing player in the NBA, however. But there’s a nice career path for true small ball center offering legit rim protection. He tries to dunk everything around the hoop and many of his shots come in the paint and go up quickly via dishes, lobs, and rim runs in transition. He attempted an underwhelming 70 free throws in 30 games, only attempting more than five in four games. This could be due to how and where he operates but could also be a concerted effort on his part to not get himself to the line. I’d probably try to stay off the line if I shot 47% too. Defensively, he works himself into nice positions for blocks, often coming over from the weak side. For how well he moves around in tight space he probably should have rebounded better in his second season at Texas A&M. 9.2 is good but it just looks like he should be getting more. That sort of thing is the knock on him – he’s not consistent and leaves you wanting more. There were two significant stretches, one at each end of the season, during which he failed to get double digit points. It doesn’t seem that he lacks an NBA motor; instead he just doesn’t keep it in a high enough gear consistently. For reasons like this he’s just a little too feast or famine to be worth taking early. The fit matters even more for players like him whose engagement and effort are fleeting. Landing on a team with good culture that genuinely cares about player development is going to be key for Williams to get off to a positive start and could determine how long and how successful his pro career turns out to be. 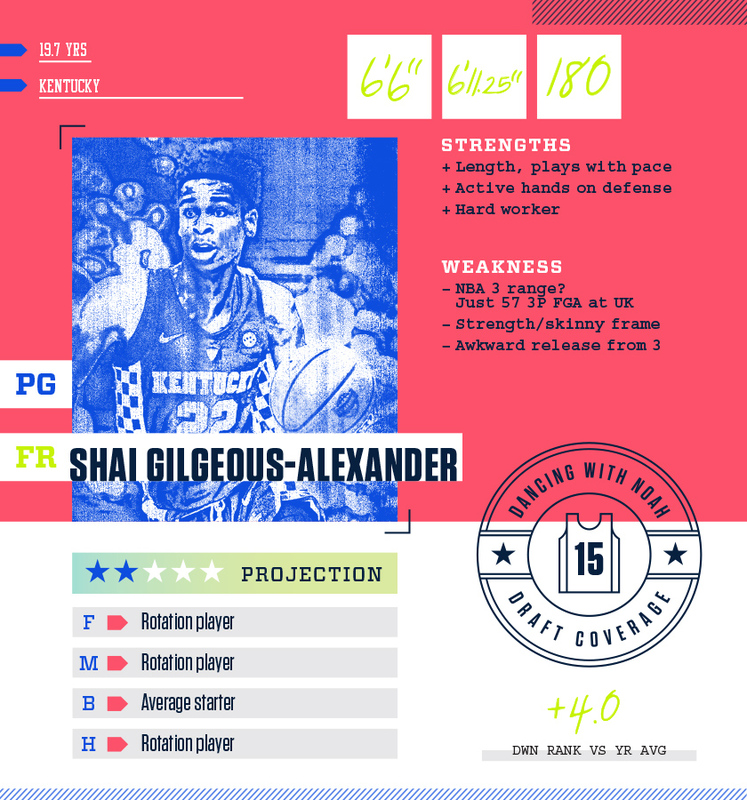 Shai Gilgeous-Alexander has a rare blend of height and length for a point guard at 6’6” with a huge seven-foot wingspan. Gilgeous-Alexander uses his wiry 180-pound frame to slither to the rim, finishing well with either hand. Despite his slender build, he’s a solid finisher in traffic and doesn’t get bumped off his spots very often. He shot a very respectable 40% from 3, but only took 57 attempts, so the sample size is small. Shooting 40% from deep at least shows he can be a threat from that distance. On the defensive end, he uses those long arms to bait opponents to throw passes that are well within his reach. That length also causes a lot of disruption for smaller point guards getting into the offense. The most noticeable flaw in his game is his lack of burst and explosiveness. He plays with a slow pace, and for someone with his length, he doesn’t seem to finish above the rim very often. Gilgeous-Alexander will need to add strength at the next level as well, but that is typically the case for most freshmen jumping to the pros, so it isn’t a huge concern. He seems destined for the late lottery where the point guard-needy Clippers have two picks at 12 and 13. He would be a good fit with undersized shooting guard Lou Williams to build a new core in Clipperland. 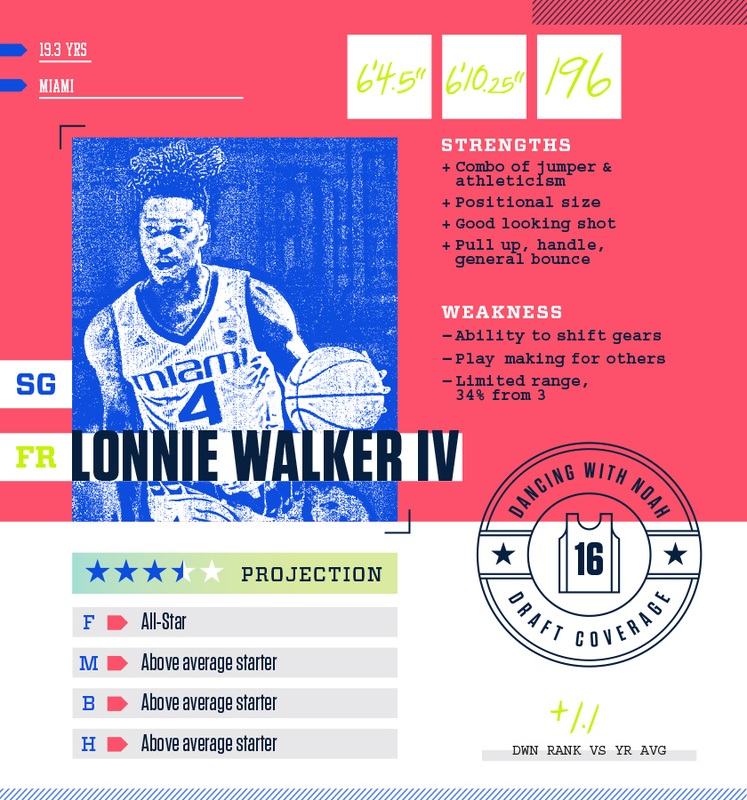 I’m uncertain why I’m somewhat enamored with Lonnie Walker IV, but since I saw him donning the orange and green of the Miami Hurricanes, I’ve been fond of him. He’s just under 6’5”, but sports a “pineapple” hairstyle which he describes as “its own person this point…people have been calling it a pineapple” that pushes his peak height up around seven feet. Imagine this kid, 6’4” or 6’5”, pineapple do’ bouncing atop his head, arms stretching out like a bald eagle (over 6’10” wingspan), sprinting, reading the arc of the ball, crouching and coiling in mid-step, and ba ba ba BOOM exploding into tip dunk motion with those long arms reaching and powerful legs propelling (40” max vertical) him into the rim. This is just part of Lonnie Walker allure. I’m not too big on coachspeak, but his Miami coach, Jim Larranaga, described him on a broadcast that he, “might be the nicest person I’ve ever coached.” Watching his NBA combine interview, I don’t know if I’d go as far as saying he’s the “nicest,” but that’s not really the purpose of the interview. He’s not quite Mo Bamba polished, but he was engaging and thoughtful, referring to himself as a “knowledge freak” and oddly suggesting “earth is an illusion.” A questionable statement, but not one that takes away from a jumper that looked good at Miami (31% from three on 3.5 attempts/game in his first 15 games at Miami coming off of a meniscus tear suffered in July versus 36% on 6.5 attempts in his final 17 games), but looked great at his agency’s pro day in late May. In the limited, non-competitive setting of the pro day, Walker’s form was refined and his range easily extended to NBA distance. But I’m not convinced what type of player he’ll be at the pro level. His handle was sufficient for the college, but he seems to struggle to shift speeds on dribble drives. His passing (1.2 assists to 1.2 turnovers in first 15 games versus 2.5 assists to 1.1 turnovers in his second) is similar to his ball handling in that it was fine for Miami where they had two other competent ball handlers, but will need work to be a secondary NBA ball handler. Physically, the foundation is there for a strong pro, but it’s the outside shot that already looks to be NBA-ready that lifts his ceiling so much higher. I put his ceiling comparison as Bradley Beal, but I’m not convinced Walker has the same instincts as a scorer. In high school, he averaged just 18-points as a senior and during his best stretch at Miami (an eight-game swing in the winter), he averaged 18 which was better than his 11.5 during the season, but still not indicative of high level scoring. I was probably over-ambitious in seeing Beal or even Eric Gordon (his mid-level comp) in his game, but given the league’s shift towards the three-ball, it’s not inconceivable that Walker is a better scorer in the pros than he was in either high school or college. That he’s engaging and appears willing to work at his craft only increase the likelihood that he can near his potential and are probably part of the attraction to the kid with the pineapple hair. Troy Brown Jr. didn’t dominate the competition his freshman year like some of his colleagues near the top of the draft, but he still put in a solid campaign at Oregon with averages of 11 points, six rebounds, and three assists. Prior to his time with the Ducks, Brown had a decorated amateur career that earned him a spot on the 2017 McDonald’s All-American squad. He’s one of the few players in this draft with the size of a small forward that can also run point for his team if needed. Standing just under 6’7” with a 6’11” wingspan, Brown was blessed with a late growth spurt in high school after playing point guard his entire life. That’s a huge advantage from a fundamental/basketball IQ standpoint, and you can tell that he has a great feel for the game on both ends of the floor. Some of the passes he finds his teammates with while he is attacking off the dribble are reminiscent of LeBron’s precise skip passes to wide open shooters. I’m not comparing Troy Brown Jr. to LeBron James, but he has an awareness of where all his teammates are on the floor that is similar to King James. The only glaring weakness Brown has is his outside shot, where he struggled at just 29% from three on 110 attempts. That lack of a consistent outside shot reminds me a lot of Evan Turner when he was coming out of Ohio State. 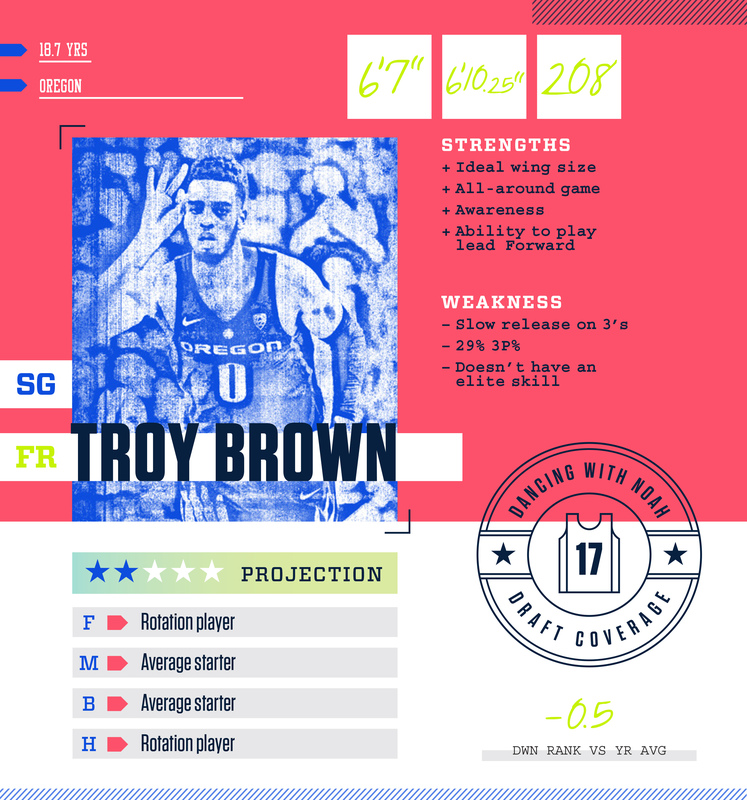 Brown is expected to go somewhere in the 12-20 range in the draft, and still has a ton of untapped potential as one of the youngest players in this class (turns 19 in July). His NBA development is going to hinge on that outside shot progressing. He still has a high floor as a solid rotational player, with the chance to become a solid starter if the three-point attempts fall at a higher rate. This spot will remain empty for 2018 and hopefully be filled by its rightful owner in 2019, Jontay Porter, an American teenager who strangely plays like a seasoned European and absolutely nothing like his older, and more highly-touted brother, Michael Porter.